"The four great forests around Aberdeen provide crucial environmental, social and economic benefits to its citizens"
In urbanised European societies, the role of forests in providing commodities, welfare, health and other social benefits is easily forgotten. But not in Aberdeen: the Granite City has been awarded the title of European Forest City for 2019 by the European Forest Institute (EFI) and is set to celebrate the versatility, significance and social impact of its forests throughout the year. Forests support the sustainability of critical resources like water and soil, and play a key role in adaptation and mitigation to climate change. They cover 35% of the pan-European landscape, hosting an important share of biodiversity and providing products and services which support the resilience of rural areas and the wellbeing of urban ones. 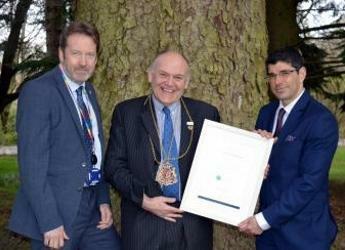 The city was officially presented with the title by EFI Director, Dr Marc Palahí, at an event held at the James Hutton Institute in Craigiebuckler. Dr Palahí said: “The award was established to recognise cities committed to forests and trees as well as to forest research and education. Aberdeen deserves this award for many different reasons. “First and most obvious because of the city relationship with forests and trees. The four great forests around Aberdeen provide crucial environmental, social and economic benefits to its citizens. In addition, the city council has taken important actions regarding the tree coverage of the city; maintaining existing trees and plating new ones, for instance within the project ‘a tree for every citizen’. The Lord Provost, Barney Crockett, accepted the award and commented: “It’s an honour to accept the wonderful award on behalf of the city of Aberdeen. Being awarded European Forest City for 2019 means we are in illustrious company with previous recipients such as Oslo, St Petersburg and Vienna. From 2014, the European Forest Institute has granted the title of ‘European Forest City’ to the city which hosts the EFI Annual Conference. The James Hutton Institute has been announced as host of this year’s EFI Annual Conference, which will be held in Aberdeen in September. The conference’s scientific seminar will focus on the role of plantation and native forests in delivering multiple ecosystem benefits in a changing climate. It will be organised in partnership with the Institute of Chartered Foresters, and with the support of Visit Scotland and the Aberdeen Convention & Events Bureau. For more information about the 2019 EFI Annual Conference visit the EFI website: https://www.efi.int/membership/ac/2019. Adam Walker, Communications Officer, Tel: +44 (0)1224 395095 (direct line) or +44 (0)344 928 5428 (switchboard).